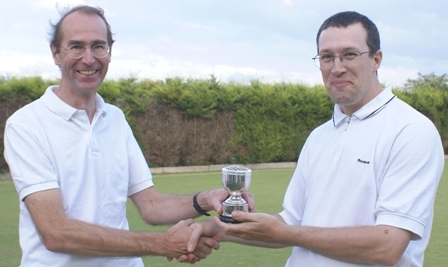 The Club runs a qualifying tournament for the Golf Croquet All England Handicap competition. The four semi-finalists qualify for the Area Finals to be held in August at Letchworth. Winners at the Area Finals proceed to the National Finals, to be played on 24-25 September at Dulwich. There are no restrictions on handicap for the qualifying tournament, but there is a maximum handicap of 10 allowed at the finals. Games will be played as single 13 hoop games to handicap difference using current handicap on the day the game is played. Nick Archer, Steve Dennis and Anne Dennis all proceeded from the Area Finals at Letchworth through to the National Finals at Dulwich, where Nick and Steve both made it through the block stages and eventually met each other in the final. Nick was the winner of a hard-fought contest between them to become the All England GC Handicap Champion, making Steve the runner up. A terrific result - congratulations to all!